'Spider Arachnid' is a plug-in for Klaus Schmidinger's fantastic Video Disk Recorder (VDR). 'Spider Arachnid' is a VDR plug-in implementation of the best patience game. It is known as Sun demo 'Spider' and Windows version 'Arachnid'. So I call it 'Spider Arachnid'. You can play it on the On Screen Display of your Video Disk Recorder. Although the most games can be won it's quite difficult. But with help of the unlimited history the game turns from pure chance to a tricky riddle. This implementation of 'Spider Arachnid' is a port from my Java implementation. 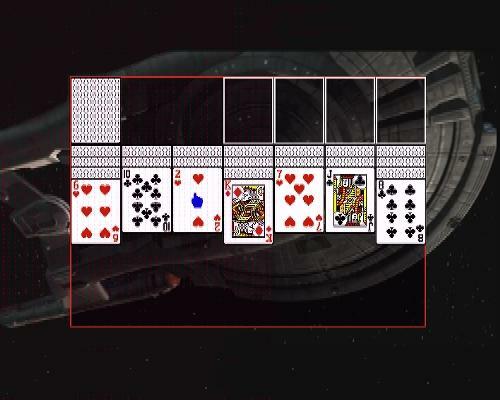 The VDR-specific parts are inspired by Sascha Volkenandt's Freecell plug-in and the card images are taken from Patrick Maier's Solitaire plug-in. After installing the plug-in you have to copy the spider folder from the plug-in's source directory to the plugins folder inside the configuration folder of VDR. If you don't specify a configuration folder, your videodir is used (e.g. /video0/plugins/spider/cursor.xpm). The object of the game is to remove all cards from the tableau. It's only allowed to remove complete suits of 13 cards. So the suits have to be assembled inside the piles. The highest rank is the King and the lowest the Ace. Initially there are some cards in the piles. Only the last card in each pile is open (face-up). You can move one open card to a matching pile where the last card has one rank above (e.g. Ace to Two, Five to Six, Ten to Jack). A sequence of matching cards with same suit can be moved at once. Face-down cards that become exposed are turned face-up. Empty piles can be filled by any card or sequence. When there are no empty piles you can deal new cards from the pack one card into each pile. You can suspend a game by pressing the Back key and resume it later (as long as the VDR isn't stopped). Variation (see below) Normal One of three variations could be chosen. Mini Variation with one deck and 7 piles. Normal Variation with two decks and 10 piles. Custom Variation with user defined deck, pile and deal counts. Deck count 1-4 2 Number of decks in the custom variation. Pile count 1-20 10 Number of piles on the tableau in the custom variation. Deal count 1-10 5 Number of deals from the pack in the custom variation. Each deal places one more card into each pile. OSD position left 0-720 48 The left offset of the OSD. OSD position top 0-576 45 The top offset of the OSD. OSD width 100-720 624 The width of the OSD. This must be a multiple of 4. Otherwise it will be aligned. OSD height 100-576 486 The height of the OSD. OSD error compensation (see below) Shrink height Method of compensation if the OSD memory limit is exceeded. Shrink height Shrink the height of the OSD. Shrink width Shrink the width of the OSD. Shrink width and height Shrink the width and the height of the OSD. Reduce colors Reduce the number of colors of the OSD to 4 colors. Some colors of the card images will be wrong. Hide top row yes/no yes Hide the top row of the tableau. It will be shown if you move the cursor to the pack. With the "Reset" button you can reset all parameters to the default values. Green Take back one move. Blue Start a new game. Left/Right Move the cursor to the left/right pile. Up Move the cursor to the pack. Ok Select all matching cards in the pile. Left/Right Move selected cards to the next matching pile left/right. Up/Down Select one more/less card. Up Remove a complete suit. Left/Right/Down Move the cursor to the current pile. Ok Deal one card into each pile. Reduced flickering on VDR >= 1.3.7. Renamed *.c files to C++ suffix *.cpp. OSD error compensation (shrink width/height or reduce colors). Added setup option to hide the top row. Set normal variation (two decks and 10 piles) as standard, together with "shrink height" and "hide top row". Generating translation files without line numbers.